Besting Bille August by a year, it has taken Austrian director Michael Haneke only four to join what we cynical film critics like to call the Emir club: the allegedly prestigious circle of two-time Palme d’Or winners, hitherto occupied only by Kusturica (1985, 1995), August (1988, 1992), and the Dardennes (1999, 2005). Counting shared Palmes as well, this group expands to include Francis Ford Coppola (1974, 1979) and Imamura Shohei (1983, 1997) plus the special case of Alf Sjöberg, whose two triumphs (both shared: 1946, 1951) predate the cultivation of the Golden Palm. If Haneke’s second Cannes win after The White Ribbon (2009) seemed as inevitable and preordained as most developments in his rigorous chamber play Amour, this can only partly be explained by the mainstream-to-highbrow hosannas greeting the director’s allegedly new and unexpected (although actually rather dubious) “tenderness” in this universal story of Love and Death after years of political parables and scholarly shocks, declaring the Palme d’Amour a fait accompli mid-festival. Given that in the previous three years it was either the designated (and also mainly critically beloved) Genius Art outlier in competition—Apichatpong, Malick—or Haneke that won, it rather seems indicative of what Cannes has become over the years. In the last two decades, the festival circuit spearheaded by Cannes has become its own market, especially for riskier, unconventional fare, while art houses, certainly in Europe, have become a more cultivated form of the multiplex for the increasingly elderly and “discerning” audiences, dominated by a certain type of interchangeable funding-friendly Euro-projects (with special saturation by French productions), ostensibly still arty by definition, no matter how shamelessly audience-baiting. The most auspicious Cannes contribution to this trend is the current triumvirate of big art-house names, guaranteeing supposedly sophisticated marquee value: Pedro Almodóvar, parfumeur extraordinaire (and probably his own best customer); Lars von Trier, provocateur célèbre (and scandalized despite his work being curiously unpolitical at its core); and, certainly by now, Michael Haneke, an agitator of a more academic and bourgeois kind: in fact his work is the perfect expression of Art as prescribed by traditional Bildungsbürgertum (“educated middle-class”). The Dardennes should be on that marquee since their second Palme, but their fusion of handheld “realism” and harnessed spirituality has been more influential for other filmmakers than successful at art-house box offices: a different kind of Bressonian cinema than Haneke’s strict disquisitions, it never clicked with the public beyond festivals, even as the Dardennes seem to be striving to get there. With Kusturica thankfully having evaporated as an audience draw, Cannes could be blamed additionally for the continued presence of Woody Allen and the late output of Nanni Moretti, bent on justifying the earlier Allen comparisons hurled at him, and not coincidentally presiding over a Cannes jury whose decisions seemed like a validation of the Cannes-approved art-house mainstream movement, with Amour its designated crown jewel. And yet, from an Austrian perspective there is something quite touching about Haneke’s international renown having been achieved by refining a culture outmoded for quite some time in the mainstream—just as it is hard to resist the irony of the Austrian mainstream now fêting a filmmaker as “our” two-time Cannes winner thanks to minority co-productions, one mostly German (The White Ribbon’s subtitle: eine deutsche Kindergeschichte) and one mostly French, with Amour (Austrian contribution: 10%) the latest in a long string of French(-language) Haneke films; the director smartly used his festival cachet in the late ’90s to go where his kind of cinema would find a financially and discursively more welcoming culture. Emerging from a mildly progressive continuation of bourgeois artisanal tradition with educational aspirations—the German and Austrian teleplay of the ’70s and ’80s as heir to novels and theatre—Haneke has become its ambitious beneficiary, stubbornly clinging to the idea of Bildungsauftrag (“educational mandate”) that today’s state-sponsored TV still invokes repeatedly for justification, even as it mostly marginalizes serious work to a degree that its symbolic function feels almost parodic. Haneke’s best work springs directly from that small-screen habitat, most notably his masterpiece, the Joseph Roth adaptation Die Rebellion (1994), a highlight of flying-donkey cinema and a vastly more imaginative and complex historical examination of early 20th century history and society than The White Ribbon (whose origins tellingly go back to Haneke’s TV times). However, his cinematic work has become less meaningful as it has become more magisterial: the first films of both his Austrian phase (The Seventh Continent, 1987) and his French period (Code inconnu, 1998) contain promises never fulfilled, as Haneke veered towards closed-off perfection, imparting very little with a very high level of formal achievement. Which is why his customary stabs at metaphysical openness have come to feel annoyingly threadbare, since the whole project is geared precisely towards one point: regardless of who conspired, Caché (2006) just mobilizes bourgeois guilt and The White Ribbon remains a schematic indictment of feudal repression as proto-fascism. Similarly, Amour lays its cards on the table in two fine opening scenes: firemen breaking into a sealed-off apartment and discovering the decomposing body of an old woman, surrounded by flowers, on her bed, and an extended audience-mirroring long shot of the attendees of a concert taking their seats—then leaves you to watch a meticulous machine grind as expected from the title and the press book’s sole five sentences of synopsis: “Georges and Anne are in their eighties. They are cultivated, retired music teachers. Their daughter, who is also a musician, lives abroad with her family. One day, Anne has an attack. The couple’s bond of love is severely tested.” (The rest of the press kit meticulously lists every award or nomination for all Haneke films.) Of course, there is something inherently touching about the sight of frail star bodies, as Jean-Louis Trintignant’s increasingly haunted Georges tries to deal with the unstoppable mental and physical deterioration of his paralyzed, doomed Anne, represented with amazing body control by Emmanuelle Riva, while we wait for him to reach the inevitable point when he considers ending her life as the ultimate labour of love. Still, Haneke feels obliged to drive the point(s) home, with even carefully applied nuances as lifelessly predetermined as the details in Darius Khondji’s mercilessly digital all-in-focus shots, conjuring up a bourgeois retreat of Schubert appreciation and quality hardwood floors, shaken by the force of destiny. 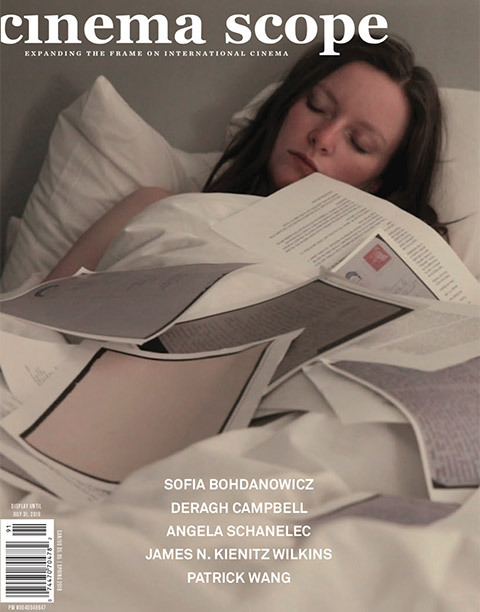 There’s also quite a bit of overdetermination to deal with, much of it shouldered gallantly by Haneke workhorse Isabelle Huppert as their dutiful, but invariably alienated, daughter. And even the film’s most surprising turn—a pigeon slooowly stalked by Georges as he tries to catch it—is imbued with a symbolic weight that tries do outdo the doves of John Woo’s operatic redemption sagas. In the end, what distinguishes this carefully calculated Haneke ordeal from its previous incarnations is mostly the personal aspect: everyone is reminded of a death in his or her family. 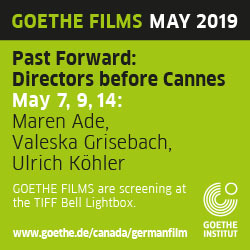 I also flashed back occasionally to my increasingly demented grandmother’s demise two years ago, only to come up with the final image of Ulrich Seidl’s Import Export (2007) instead: an absurd aria of transience, and a reminder that Austria’s other foremost festival brand, opposite (in many ways) to Haneke, contains an essential element of Volkskunst. Considering 2012 as Cannes’ year of love, Seidl’s Paradise: Love adhered to this principle of popular art by treating the titular subject with subversive glee as an inherently contradictory illusion, whereas Miike Takashi’s relegated-to-out-of-competition highlight For Love’s Sake found a no less ambivalent, but jubilatory expression as pop art, befitting its adolescent protagonists. 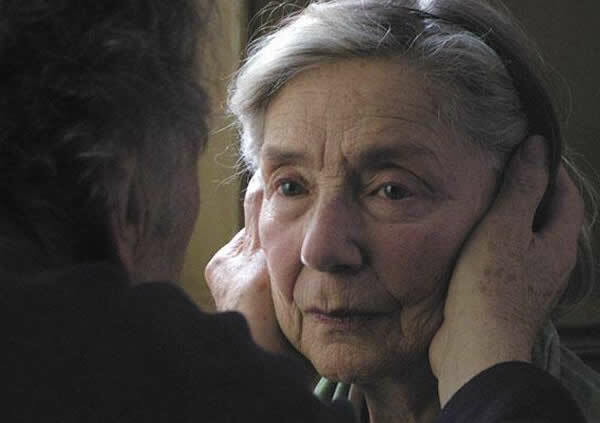 Haneke, meanwhile, adhered demonstratively to the world of his polite, bourgeois couple, tactful even in the “provocations,” making Amour the ultimate in art-house art: a film that comfortably ushers its dwindling target audience towards its eventual demise. What else should have won?